WinZip is one of the most widely used Windows Compression Utilitiy. It also helps you to reduce clutter by stacking up several files and folders into a single ZIP file. Most of us think that WinZip is free! But, the fact is that it isn’t. For this very reason they have written in huge bold fonts ‘$29.95’ to convince people that it’s not free! Well, spending $30 for a compression utility is just too much I feel when there are other similar utilities like 7Zip available for free. But, don’t you worry folks there’s a way to get it for free. How to get a full License of WinZip for free? 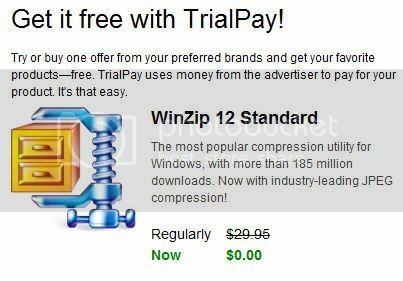 WinZip 12 costs $29.95 but they have partnered with other product sellers using trial pay. So, if you sign up and choose any item from a huge collection of options varying from online services, financial products, computers, clothing, music, etc and try it, you get WinZip for free! So, how do they manage to do this? TrialPay uses money from the advertiser to pay for your product! There are so many options to sign up for. For instance, you can get a free trial for Rhapsody or RealPlayer and cancel it before the trial period is over to get a free WinZip copy. The best option is to sign up for eBay if you still haven’t and get a free copy of genuine WinZip. So, what are you waiting for? Have a look at different options and get your free copy of WinZip here.